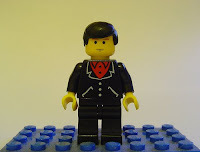 The LEGO minifig is 30 years old- a fact currently being celebrated over at GoMiniManGo. I am also 30 years old. Coincidence? Probably. The iconic figure has driven play for the last three decades inspiring children to build transportation and housing for the minifigurines that came with sets. It has also inspired the scale of buildings as people attempt to relate their structures to the tiny plastic guys. If you've ever wondered how they're made, Gizmodo has a quick video from the factory that is mesmerizing. But just like Geppetto, I bet my parents are glad they ended up with a real boy and not a minifig.